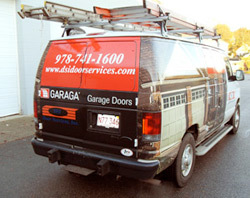 At DSI North Door Systems, our specialty is the sale, installation and repair of garage doors and garage door openers in Salem and the surrounding areas. Our team of experts has been in the garage door business for many years, and is very well-informed when it comes to detecting and fixing the problems related to your garage door or garage door opener. Trust our expertise and professionalism to take care or any issues your garage door system may encounter, or to set up a preventive maintenance program. Are a member of the IDA - International Door Association and the Professional Door Association of New England. Are an EPA (United States Environmental Protection Agency) Lead-Safe Certified Firm. Are an IDEA Accredited Door Dealer. Serve: Beverly, Boxford, Danvers, Essex, Georgetown, Gloucester, Hamilton, Ipswich, Lynn, Lynnfield, Malden, Manchester-by-the-Sea, Marblehead, Melrose, Middleton, North Reading, Peabody, Rockport, Rowley, Salem, Saugus, Swampscott , Topsfield, Wakefield. Springs are the part of your garage door that does most of the work in lowering and lifting your door. For this reason, frequent maintenance is needed, and they must be replaced once in a while. Whether torsion or extension springs are used in your garage, the DSI North Door Systems team can help you upkeep your investment. If an unusual noise coming from your garage is noticed when it is being opened or closed, it might be caused by the track not being aligned properly. Not only is excessive amount of noise caused by misaligned tracks, but it is also a safety hazard for the residents of your home. This matter can easily be resolved by contacting us, and we will send a repair team to realign the tracks of the garage. If the issue is not dealt with in a timely fashion, the garage door could come off its tracks. In this situation, it is imperative that a service call be scheduled so that technicians come to your home to put the garage door back in place, balance and align the system, and perform the necessary maintenance to prevent such an incident from happening again. Garage doors can and do come off track for reasons other than regular use. For instance, events like earthquakes or being hit by a car or other heavy object may damages your tracks or garage door. The 100% Garaga logo found on all of their residential doors means that Garaga, as a manufacturer, certifies your entire garage door, and that all of the components of your garage door system are either manufactured by Garaga, or meet their high quality standards. As for DSI North Door Systems, we guarantee you will be completely satisfied with your Garaga door as well as all the services, from sales through maintenance, which we provide.